We have a new reviewer on The Popcorn Bucket, she’s called Miss Lily Rae and she’s even more sarcastic than I am. Honestly. Anyway, she sent in her review of some guff starring Rachel from Friends and Harvey Dent. Rock on! 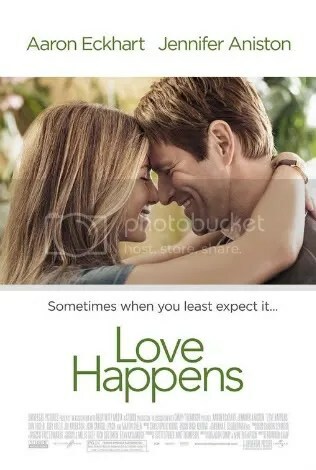 The debut film from director Brandon Camp, Love Happens tells the story of Burke (Aaron Eckhart), a man struggling to come to terms with the death of his wife, and Eloise (Jennifer Aniston), a florist determined to help him move on. Burke Ryan, a man with the empathy of Trisha Goddard, is the author of “A-OK!,” a bestselling self-help book. In his seminars, Burke smiles beatifically at his grieving audience whilst constantly reminding them that “I’ve been there.” Privately, he goes dark and brooding every ten minutes over the death of his wife, be it in the low-key lighting of the Space Needle or the low-key lighting of the hotel pool. Enter Eloise (Aniston), a flicky-haired florist with a penchant for doing ‘kooky’ things such as writing long words behind paintings and communicating in sign-language (neither of these inane habits is ever explained.) After the fastest break-up in cinematic history, Eloise inexplicably becomes the mohair-jumpered girl of Burke’s dreams. Love Happens is a very confused film. It sets out as a romance with Burke and Eloise’s encounter in the lobby of a hotel, morphs into a drama as Burke begins to accept that he hasn’t been able to move on since his wife’s death, before suddenly becoming a comedy, with a surreal subplot involving Burke breaking into his in-laws’ house to steal a parrot. Although the subject of grief and loss is dealt with in a remarkably heavy-handed way, there is genuine poignancy to be found in the character of Walter, a man left devastated after the death of his son, who doesn’t believe Burke’s shtick. However, even Walter succumbs to the benign smile of Burke by the end, after a montage in a home-depot. Had more thought gone into the plot progression, had the subplots gone somewhere, had the character of Eloise actually had a point, Love Happens could have been a credible drama. The romance between Eloise and Burke seems at odds with the rest of the plot – the unconvincing chemistry between the two characters does nothing to help this, both being so incredibly self-absorbed you wonder how they ever managed to notice each other. Both performances are unremarkable and lack charisma, and the supporting characters – Burke’s manager, Eloise’s shop assistant and Burke’s father-in-law – just feel undeveloped and annoying. As Eloise says, “My life is a day by day experiment in very bad decisions.” Rarely does a film sum itself up so perfectly.